There are Lots of Things To Do in Herceg Novi. If you find yourself travelling to Montenegro, you should certainly check out Herceg Novi! Lots of travellers ask themselves “Is Herceg Novi worth visiting?” – and we think the answer is yes! 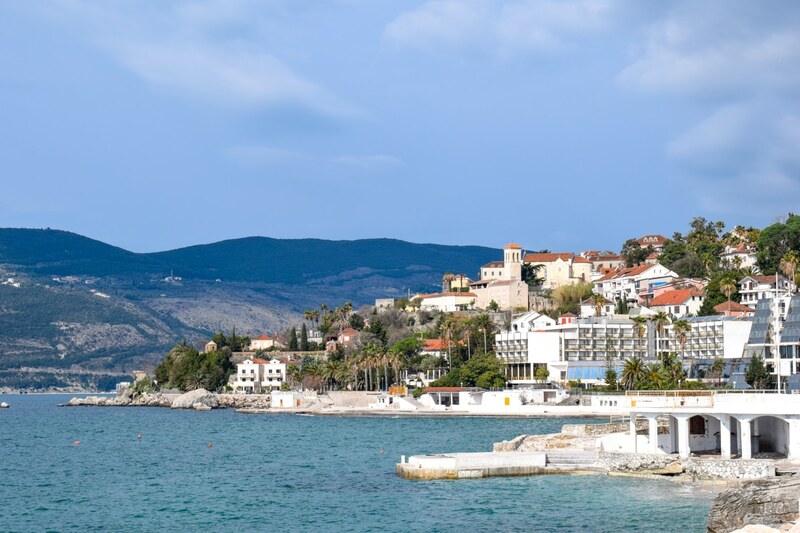 We stopped through on the way up to Split and had a great time exploring the seaside town. 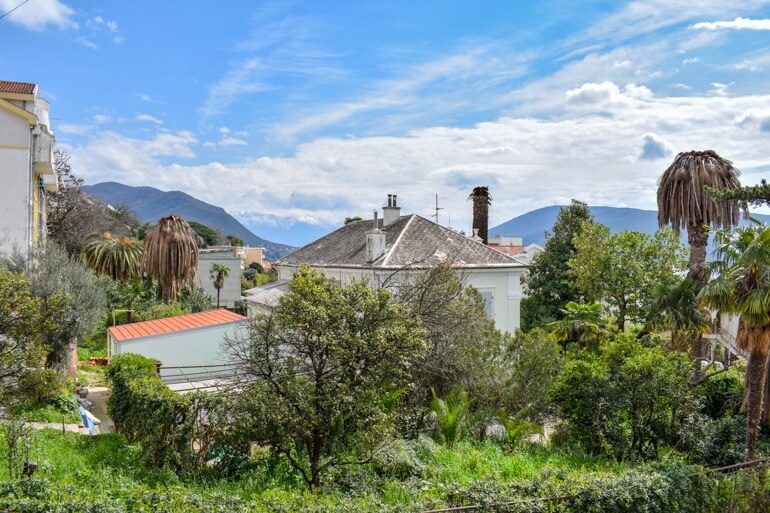 From the Herceg Novi old town to the restaurants in Herceg, we’d recommend a short stay so that you can get a better picture of what the north of Montenegro is all about. Here’s our guide on things to do, a review of where we stayed in Herceg Novi, and a few places we ate at. If you want to see what Herceg Novi looks like, check out the video YouTube Channel here for our wander through the old town, along the waterfront promenade, and more. You can also just watch the video snippet below. Warning: This video may give you wanderlust and make you crave sunshine and the ocean. You have been warned! Herceg Novi is located on the northern coast of Montenegro on the Adriatic Sea. It’s approximately 1 hour 15 minutes from Dubrovnik. However, you’ll cross the Croatia/Montenegro border so do factor that in depending on in which season you’re travelling in. The line-ups of cars and buses can be LONG. Once you’re in Montenegro, Herceg Novi is right beside the other seaside town of Igalo, and about an hour by bus from Kotor. From the capital, Podgorica, the bus ride was about 2 hours 30 and we travelled through the mountains which was pretty cool. You’ll see pretty quickly that the street along the coast of Montenegro makes travelling along the coast (and into Croatia) really simple. There are buses going in all directions so you don’t even need to rent a car. You just have to buy the tickets and hop on the correct bus. Obviously, you should check the bus schedule beforehand! 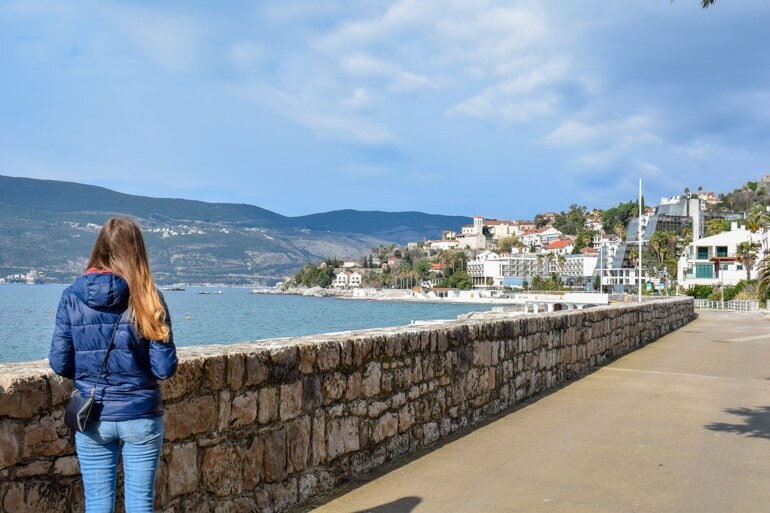 If you want to learn more about our route from Podgorica to Split which includes travelling through different coastal towns in Montenegro, we’ve written about our whole bus riding experience in this post on travelling from Podgorica to Split. Lisa exploring the ruins of the coastal buildings. Explaining the history of the small seaside town in a few sentences would be really difficult since there is a lot to talk about! The town itself is fairly quiet and modest. However, its location at the entrance to the Bay of Kotor made it a strategic place to hold for various civilizations over the centuries. Side Note: If you’re in the area, a trip to Kotor would definitely be worth you time. 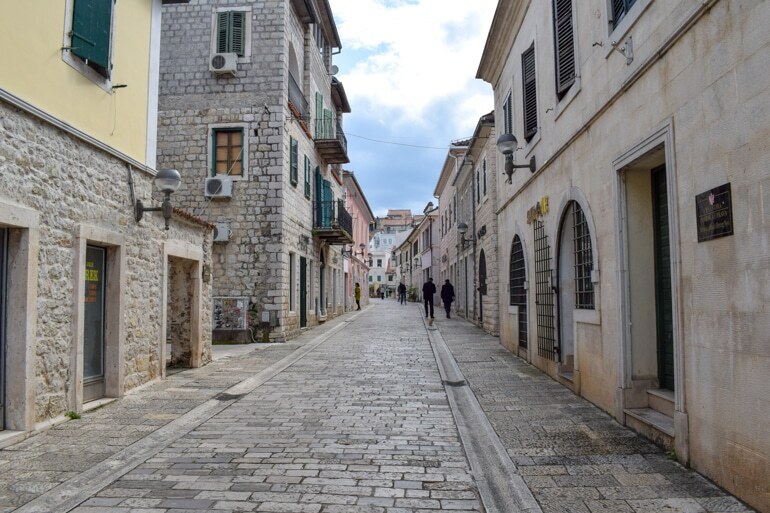 We loved the town and wrote a whole guide on things to do in Kotor! Founded in the 1300s, Herceg Novi has been ruled/taken over by the original Bosnian King Tvrtko I Kotromanic, then by the Turks, Spanish, Venetians, Russians, French, Austro-Hungarians, Serbian Army, Italians, Germans, and Yugoslav Republic. Today, Herceg Novi is in the country of Montenegro and that’s the end of it! As a result of centuries of change, there is a rich history mixed into the architecture, the nature, the culture, and the traditions of the area on the north Montenegrin coast. As with many of the places on the Adriatic Coast, there are lots of places to stay in Herceg Novi. The apartment culture or the “apartmani” are prevalent here. As a result you won’t find as many traditional hotels compared to seaside towns in other parts of Europe or the world. We went in the off-season and had a great selection of places still available. If you’re planning on visiting between May and September, you’ll likely want to book far in advance to secure the best places by price and location. We really liked the place we stayed at in Herceg Novi, so here’s a little description of our stay at Apartmani Jadran. The place was great. It was a studio apartment with a balcony that faced the sea so we had a great view. It was also the first time we had reached the coast on our trip and had any sort of sunlight (sorry, Romanian winter) so it was extra special. The view from our apartment in Herceg Novi was…. really, really great. The apartment had a small kitchenette with two hot plates and a mini-fridge. This made preparing a few meals really simple to do give that there were enough cutlery and utensils to use. The bathroom was clean and large, the room overall was clean and bright, and the host and the housekeeper were VERY nice. Check-in was simple. The location is also just a 10-minute walk to the centre of the old town. There is a grocery store close by and it’s just a 5 minutes walk down some stairs to the water’s edge and the promenade to walk along. We’d highly recommend it – and we’ll certainly return if we head back to Herceg! If you want to check out Apartmani Jadran, you can see where we stayed here! Herceg Novi isn’t the tourist capital of the world and that’s what makes it great. There are lots of things to explore and you can enjoy the town for its quietness compared to the crazy busy places like nearby Kotor or Dubrovnik. That said, here are a few of the things we did while we were there and a few of the things we WISH we had looked into while we were there! Keep in mind, it was the off-season when we visited (end of March) so many of the excursions/activities that were water-based weren’t running. We still loved Herceg! Just walking along – 6 more kms to go! Once you head down to the water, you’ll see the promenade. The walkway called “Pet Danica Walkway” is 6 km long and stretches from Igalo, through Herceg Novi, and into nearby Meljine. We walked quite a bit of it while staying in Herceg Novi (we even stopped for a coffee, read down below) but nowhere near the entire length! It’s a nice and wide pedestrian way that hugs the shoreline and makes for great views and getting as much sea air as you can. Often, you’ll see stairways down to the “beaches” which are sometimes just concrete slabs that people lay out on – but that’s the Montenegrin way, we suppose! There are also lots of ruins and pathways that lead to smaller coves along the shoreline which are checking out. Just make sure you’re allowed to be there! Literally meaning “bloody tower” this massive stone tower sits high above the Herceg old town. Back in its day, it was a prison used by the Turks. Visitors can head down into the dungeons and see where prisoners etched writings into the walls. Kinda cool, definitely eerie! These days, the massive top seating area is used as a theatre for movies or performances holding a few hundred patrons! If you’re visiting in the summer, you might even be lucky enough to see a show while you’re there. The entrance fee for a visit is about 2 euro and even if the tower itself doesn’t offer a great deal of explanation, the views are beautiful from up there. The Old Town is a beautiful wander any day. We really liked the old town in Herceg Novi. At the time, we had only just arrived in Montenegro and hadn’t yet stayed in Croatia for a few weeks. After having visited old towns in Croatia like Split, Dubrovnik, and Trogir, the old town in Herceg is small but feels really authentic. Mind you, it wasn’t the busy season yet so we can only hope that it keeps its charm in the summer! The pathways are often that smooth stone. In other places, you’ll find stairways built of old stones leading to different alleyways and streets. Just wandering around is an adventure in itself. Often you’ll pop out at a pathway you’ve walked before but never imagined you’d get there by taking the route you just wandered. Overall, there are plenty of shops and cafes to stop at if you want a break. There are literally pieces of history around each turn so feel free to explore the different parts of the old town. As mentioned above, it was the off-season so we really didn’t have a crazy amount of options for things to do in Herceg Novi. Most of the bigger “attractions” were closed. For us, this was fine since we were just passing through and wanted a sampler of the town. It didn’t disappoint and we will certainly be back to do a few more things, listed below! 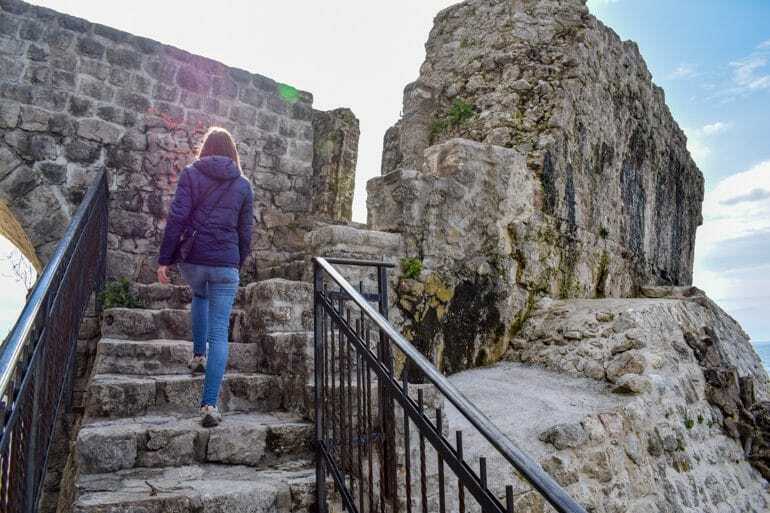 The Mare Fortress was originally built by the first Bosnian King who founded Herceg Novi. Over the years it has been rebuilt a few times as it changed hands. Originally a defensive position to protect the town from sea attacks, the tower was converted to a movie theatre in the 1950s. Today, visitors can enter the tower and discover the numerous passageways, ladders, and stairs in the stone complex. Unfortunately, it was closed when we visited Herceg Novi. During the summer months you can climb to the top for a small fee (1.00 euro). From there you get a stunning panorama of the entrance to the Bay of Kotor and the Adriatic Sea. We want to do it really badly! Herceg Novi’s location at the entrance to the Bay of Kotor makes it a wonderful place to explore the Adriatic Coast and the smaller towns in the area. One of the most popular attractions from Herceg Novi is the Blue Cave or the “Plava Spilja”. We’ve already written about exploring a Blue Cave in the Croatian Islands and this one seems just as beautiful. The cave is located on the Lustica Peninsula. You’ll need to take a boat to get out there and explore the cave as well as the surrounding areas. Luckily, there are a few ways to do this. You can hop on a guided tour that leaves from Herceg Novi by booking in advance or walking down to the harbour to check out a private tour. There will be skippers asking if you’re interested in heading out to the Cave in the high season. You could also hop on a kayak/snorkeling tour that will take you out there as well. These tours often also include other coves, beaches, and sights. Some of the more popular ones are Fort Mamula and/or Our Lady of the Rocks in the Bay of Kotor. Whichever you choose – just be sure to shop around for the best price and look at the online reviews of the company/tour! Even though it was the off-season and some restaurants and cafes were closed, we still had a great time grabbing a coffee or having dinner while out in Herceg Novi. That said, we went to these exact places and really enjoyed them! We wanted to treat ourselves to a great seafood dinner while in Herceg Novi. We read the reviews and settled on Konoba Feral, which was right on the water/main promenade. Eric had a seafood pasta and Lisa had a seafood risotto – both of which were VERY good. We also shared a chocolate crepe for dessert which was honestly amazing. 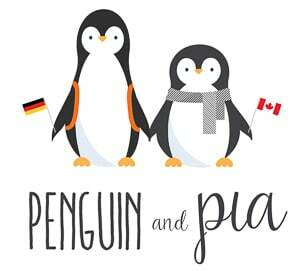 The waiter was super friendly – and once we struck up a conversation we realized that he had stayed in Canada before. It was great to hear about his past travels and family ties! Overall, we had a great experience that was fairly inexpensive – so we would totally recommend! Check out the website for Konoba Feral here. 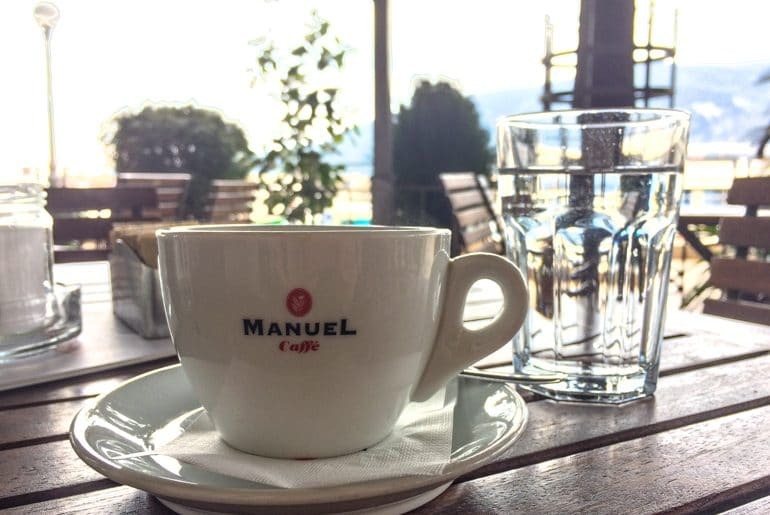 Mandatory coffee time at Manuel Cafe. When we walked the promenade on the first day Lisa pointed out a really nice looking cafe patio and we decided that we wanted to check it out. Turns out, it was Cafe Manuel. Located right across from the main harbour, you get a great view of the boats. It’s also a fantastic place to people watch if you’re into that kind of thing. Long story short, we didn’t eat here. We did, however, walk by it about 6 times from the Old Town to our apartment. After reading the good reviews we determined that if we had another night we would have tried it. It’s the kind of place that certainly felt more “local” based on its location but still welcoming to foreigners. Karaca is to the right of a small asphalt soccer field/basketball court that often has kids playing on it. It’s just to the east of the Old Town and not close to the water. We’d put the address but Google just says “Herceg Novi” which isn’t overly helpful! Just google the name and you’ll find it! 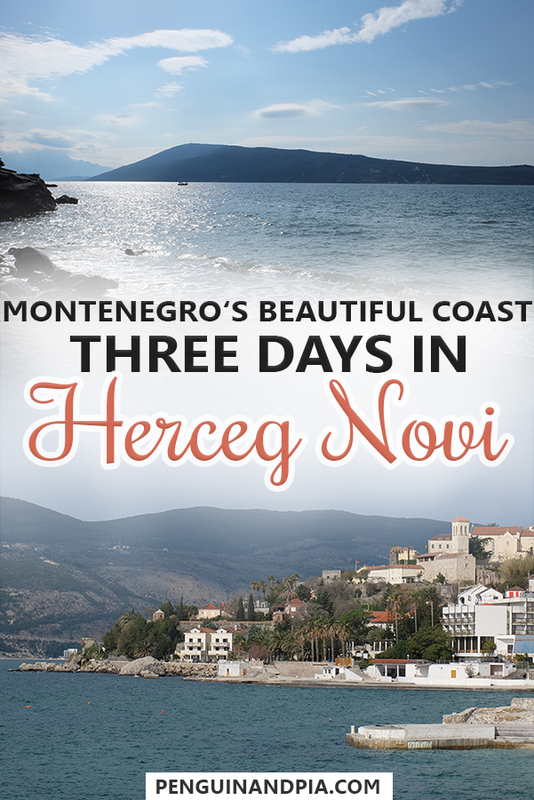 And there you have it – how to spend a few days in Herceg Novi! Even though we only had 3 days there we really enjoyed it. We would certainly stay again if we were on the northern coast of Montenegro. It’s a great seaside town that feels hidden between the busyness of Dubrovnik and Kotor. Those places are great – don’t get us wrong – but Herceg Novi is special in its own way. If you go, let us know what you think!